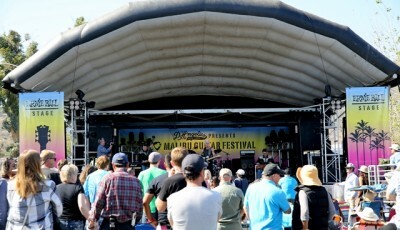 If you’re like me and you love guitars, the Malibu Guitar Festival is like a dream come true! The event runs from Thursday May 18th through Sunday May 21st in the Malibu Village. 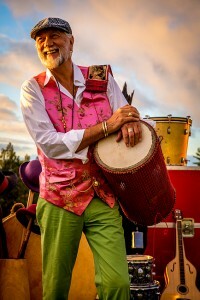 The festival was founded by local music and guitar lovers Doug Deluca and John Watkin to bring pro-players, amateur strummers, rock legends and guitar makers to the beach community for together for three jam packed days of music. The show is presented by D’Angelico Guitars and features some of the top masters of the instrument along with a cast of up and coming support talent. 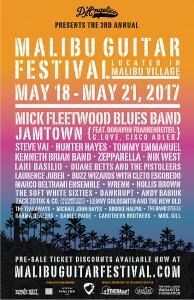 Headliners for the 3rd Annual Malibu Guitar Festival include; Mick Fleetwood Blues Band, Steve Vai, Jamtown (featuring Donavon Frankenreiter, G. Love & Cisco Adler), acoustic guitar wiz Tommy Emmanuel, country star Hunter Hayes and more. The opening night fundraiser on May 18th will benefit the Emily Shane Foundation, TheraSurf and Karl LaDue Wodakota Foundation with an All-Star Jam (to be announced). A Humanitarian Award will be presented to Chief Arvol Looking Horse, Chief Of All Stars Nations and Keeper Of The Sacred Bundle For The Lakota, Dakota, and Nakota Nations. A “Lifetime Achievement Award“ will also be presented to Doors guitarist Robby Krieger to honor the 50th anniversary of the band. “Hot Licks Night” on Friday May 19th at the Casa Escobar just across from the Malibu pier features rock guitar virtuoso Steve Vai, Nik West, Lari Basilio, Gretchen Menn, The Band Steele, the female Led Zeppelin tribute band Zepparella, Dankrupt, Carothers Brothers and Karma Dealers. Main Festival Day at Malibu Village on May 20th features the Mick Fleetwood Blues Band; Jamtown (featuring Donavon Frankenreiter, G. Love & Cisco Adler), Tommy Emmanuel, Hunter Hayes, Kenneth Brian Band (featuring Steve Ferrone on drums), Duane Bettes’ Pistoleers, Hollis Brown, Wrenn, The Soft White Sixties, Zack Zotos & Company featuring Eric Clapton collaborator Marcy Levy & Deacon Jones, The Buzz Wizards (featuring Jimmy Kimmel band leader Cleto Escobedo), Michael John Hayes, Tower of Power/Sweathog singer Lenny Goldsmith & The New Old, The Band Steele, and locals Mrs. Gill. 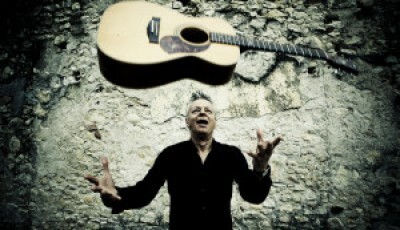 For more information go to http://malibuguitarfestival.com. 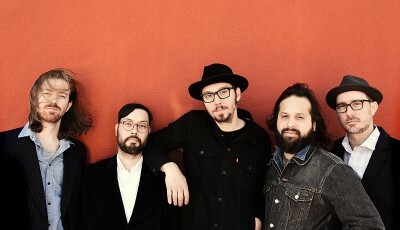 “It is such an honor to be included on a bill with these amazing artists. We can’t wait to come to California and take part in this great event. Going to bring our D’angelico guitars and crank em loud!! Malibu here we come! The final day of the festival on Sunday May 21st (also in the Malibu Village) will include a “Rolling Stones Brunch” paying homage to the band with a special presentation by musician/author Andy Babiuk from his book “Rolling Stones Gear: All The Stones Instruments From Stage To Studio” with live performances by The Tearaways, Brooke Halpin and more special surprise guests. And all this is for a good cause! In 2016, the Malibu Guitar Festival raised over $100,000 for Mending Kids, Boys & Girls Club of Malibu and TheraSurf. Co-Founder Doug Deluca is a Co-Executive producer for Jimmy Kimmel Live, John Watkin is co-owner of the Emmy-winning Planet Grande Pictures, and Alejandra DeLuca is a Meditation and Motivational Coach and owner of Manifesting Success and Wellness. Together, they leveraged their collective networks to bring the 2015 inaugural festival to fruition, which was honored with a Dolphin Award, in recognition of their service, commitment and contribution to Malibu.